Take a look under your couch cushions; what do you see? Some loose change, maybe some lint, dirt, and perhaps a Cheeto chip snuck through down there. This is because cleaning your furniture upholstery is one of the most overlooked chores in your home. To keep your home in pristine condition, you’ll need to clean your furniture regularly as well. Some chairs are made of wood or metal and are easy to clean, but what about your upholstered furniture? Today, we’ll explore the various methods of cleaning different types of furniture our cleaning services in DC employ. Leather furniture looks nice, smells great, and requires just a little maintenance to keep in good shape. 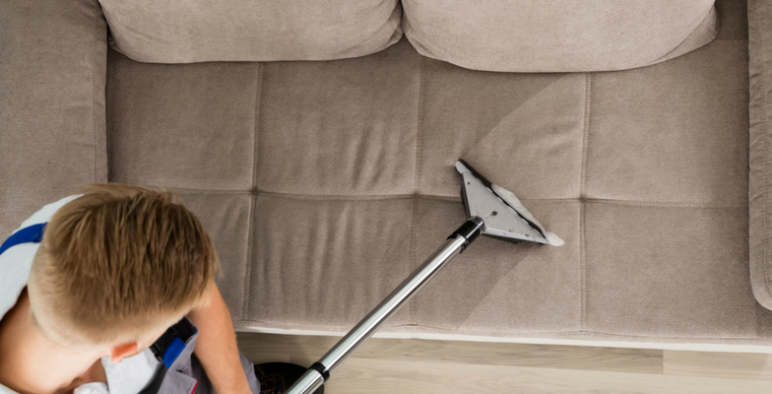 Before you clean the leather surface, remove the cushions and run a quick vacuum over the couch frame to remove the buildup of dust and grime. Pick up any coins that may have slipped out of your pockets by hand. If you have to remove some stains before general cleaning, you can purchase a custom leather stain remover, but what’s the fun in that? We always recommend using homemade remedies or simple solutions whenever possible. For leather stains, you can simply use a cotton swab dipped in rubbing alcohol. Rub the stain thoroughly with your cotton swab and use a microfiber cloth to wipe off the excess alcohol. Repeat 2-3 times or until the stain is completely gone. Now it’s on to the cleaning. For leather you can use a basic moisturizing soap, such as Jergens Extra Moisturizing Hand Wash. Lather the soap onto a clean rag without adding water. When rubbing the soap into the leather, you can apply a bit of force to work the soap into the cracks and crevices. Sprinkle just a few drops of water while you’re rubbing to keep the rag moist but don’t overdo it with the water. Instead of rinsing away the soap, use a dry cloth to buff out the excess moisture. To revitalize and preserve the quality of the leather, you can mix one cup of white vinegar with two cups of linseed oil into a spray bottle. Shake the bottle well and spray the surface of the leather cushions lightly. Using a clean cotton or microfiber rag, rub the solution into the leather using circular, “wax on, wax off” motions. After 10 minutes of working elsewhere, use a dry rag to buff the leather again. Now your leather furniture is shiny, clean, and ready for sitting. The most common type of couch and chair upholstery is cotton. It’s comfortable, stylish, and breathable. The only downside is that cleaning your cotton furniture can be tricky. Thankfully, most designers have added cleaning codes to your furniture so you know exactly how you can clean the cushions. The codes can be found on the manufacturer tags usually located on the back side of the cushion. W: If you find a W on your tag, then you can safely clean your upholstery with water or water-based solvents. This would indicate that your cushions are durable and will not stain easily with water. Feel free to use a shampooing vacuum or a damp rag to work into the fabric. S: If you find an S on your tag, then your furniture can ONLY be cleaned with dry cleaning solvents. Using water could cause permanent discoloration or staining. Some stores offer dry cleaning solvents for home usage; if you decide to take on a stain yourself, be very careful and use a blow dryer immediately after spot-cleaning the stain to avoid an unsightly ring. S/W: This code means that you can use a combination of water-based products and dry cleaning solvents. While this sounds a bit better than dry clean only, that could be misleading. Some areas of your couch is wash-safe while other parts are not; this could be tricky if you don’t know which areas are which. It’s best to leave this type of fabric to professional cleaning services. X: This code isn’t seen too often anymore but is reserved for less commonly seen wool blends or rare fabrics like silk, suede, or velvet. Unfortunately, this means that your cushions can not be cleaned with washing or dry cleaning. Vacuuming them is the only way to go here and if you happen to stain a cushion, you may need to replace the fabric altogether. For the purposes of this how-to, we’ll focus on the W tag. To reiterate, this means that your cushions are washable with traditional water-based solutions. Start off by removing the cushions and thoroughly vacuuming the frame with your bristle attachment. Also, lightly pass your vacuum cleaner over the cushions to keep dust and crumbs from settling into the fabric. We have a couple of different options for washing the fabric. You may rent or own a shampoo vacuum; this will work well to remove light stains and odors. Another popular option is steam cleaning. For smaller cushions or heavily-used areas, you won’t need to rent a full steamer. An iron with steam button will work wonders on your cushions but make sure not to press too firmly. The iron’s heat could cause discoloration on more delicate or lightly colored fabric. If hand washing is your preference, mix up a green cleaning solution of dish soap with lukewarm water. Use a tablespoon of dish soap with 2-3 cups of water and shake well. Use a damp sponge to blot out any stains but don’t scrub. You don’t want to risk having the soap seep into the cushion or dulling out the fabric. After washing, use a towel or cloth to press on the fabric and help dry the excess water. If any tougher stains remain, repeat the process. This is a tricky process and it could be risky, but the results are worth it. You will be much happier with fresh cushions that smell great.